Don't Miss This Groundbreaking Opportunity. Buy one Today! The VB2 converts any solid or liquid into vapor, regardless of consistency or plant matter content. VB2 handles solid extracts as well as it does pure oils. Once your materials are dropped or dabbed onto the heating element, vaporization happens instantaneously. After switching on the VB2, its control circuit provides extra power to heat up quickly. VB2.0's dual ceramic heaters stay within 150W so you can use it on 12V (with an inverter). VB2.5 is quite different- at 700W it goes to max temp within 20 to 30 seconds. We build VB2 with the same ceramic, glass and silicone as we have in our vapor boxes for well over a decade. Vaporbrothers' self-imposed standards ensure no overheating and no chemical odors emitted. The only plastic you will find on the VB2 is in the electrical panel on the base. The VB2’s ceramic heater self-cleans on its highest setting. Residue from "low temp dabbing" or plant content disappears after a short time. The surrounding areas accumulate over time and can be restored with strong ISO or pipe cleaning solutions. VB2.5 turns off after 10 minutes and can be back to vaporizing within 30 seconds of being turned back on. VB2.0 can handle being on indefinitely. However, the housing and silicone grip becomes hot to touch after about 20 minutes, so the VB2.0 also shuts down for safety. Reset by turning the control knob off and on. Our relentless effort started over 15 years ago when we invented the first Whip® based vaporizer, promoting the cause of vaporizing to a world that had never heard of it. (This was before "Volcano") Since then we've survived despite dozens of copycats and competitors. Our products' effectiveness are one reason we keep doing what we do. While others have come and gone, our innovative spirit and attention to detail has kept us on the forefront of the vaporizing world. Over 15 years ago, we created an easy way to vaporize dry herbs with a vapor hit so dense, clean and efficient that it changed the paradigm of smoking forever. Vaporbrothers invention became the originator of all Whip based vaporizers today. Our simple yet amazingly effective vapor box became the most iconic vaporizer in the world. 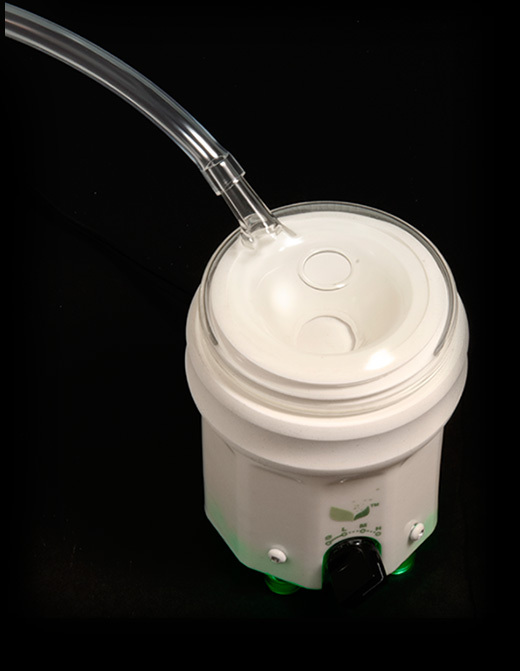 With our new product, VB2, we hope to change vaporizing once again- this time for solids and oils. VB2 follows our self-imposed standards of using only glass and ceramic in the hot zone. If any metal pieces are involved, they are carefully selected to not break down over time. (Titanium is not good enough) Our efforts toward highly inert materials along with careful mechanical engineering design eliminates the odors that are common in other vaporizer brands. We do not allow plastics or common metals into the heated areas of our product. With Vaporbrothers you know you can get the best taste possible every time. Since it is electronically heated, there is NO butane involved. After multiple trial runs with experienced extractors in the industry, we've improved VB2 with direct inhalation for maximum flavor retention along with various connection options to rigs. People tell us that VB2 not only makes their dabbing experience easier and safer, but it also produces a finer mist from herbal medicine. VB2 represents 5+ years of development and 15+ years of experience with glass and ceramics. All VB2 models are created at our facility in Los Angeles. Copyright © 2015 Vapor Brothers. All rights reserved.